If we’re going to be honest here (and why shouldn’t we be), our backyard is a sore spot for us. It’s not what we want, but we’re working on it. But our gate seemed to always set the tone for what we were getting into when we walked into the backyard. The fence and gate that came with our house was a collapsing mess. Looking at it while it was closed, sure, it looks fine. But as soon as you got close, all the problems became apparent: there’s that board in the middle that is a different size, the posts are all out of alignment, the 2x4s are all warped … and don’t even get Kerry started on the latch. Let’s just say that the latch had a bit of a learning curve. Getting it to open and close was not the easiest thing, and even after 3 years of practice, we still had issues with it every time. Kerry in particular HATED this latch. She was about one more, “Sam figured out how to use it, it’s not THAT hard,” away from screaming, “Well maybe Sam should move in with you!” at me (note to all spouses: pointing out that a friend of yours can do something while your spouse can’t is not a good idea). But she was right. 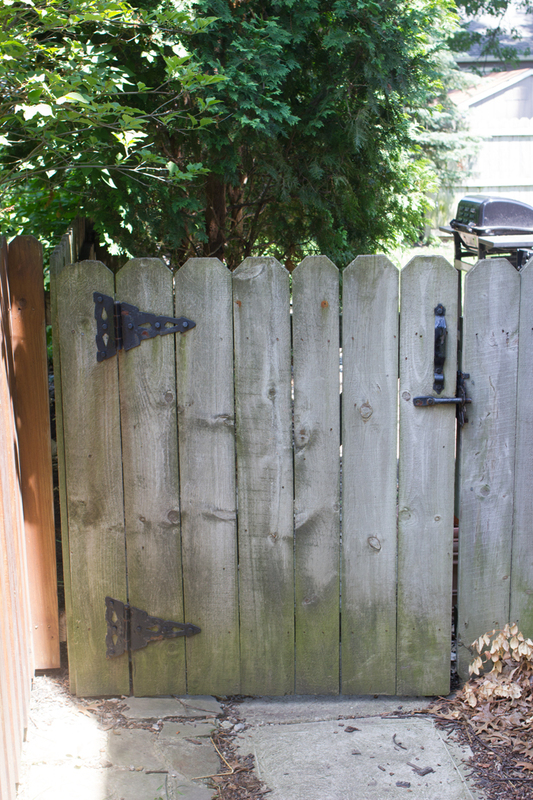 There were enough issues with this gate in general, including the latch, that it was time for a replacement. After claiming for three years that it wouldn’t be a very difficult fix, I took on this project when I had a few days off of work. 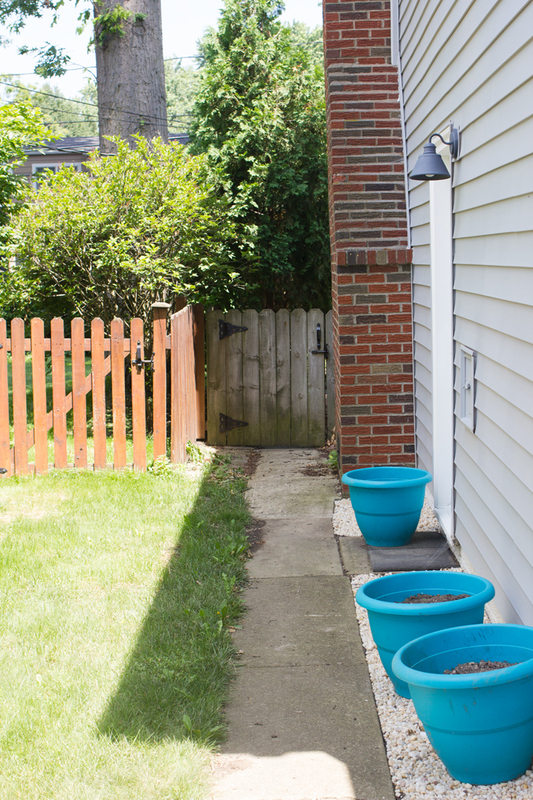 It was relatively simple, with the only real down time being letting the stain on the new fence boards dry before moving on. After doing a bit of research, I bought this “no-sag” gate kit. 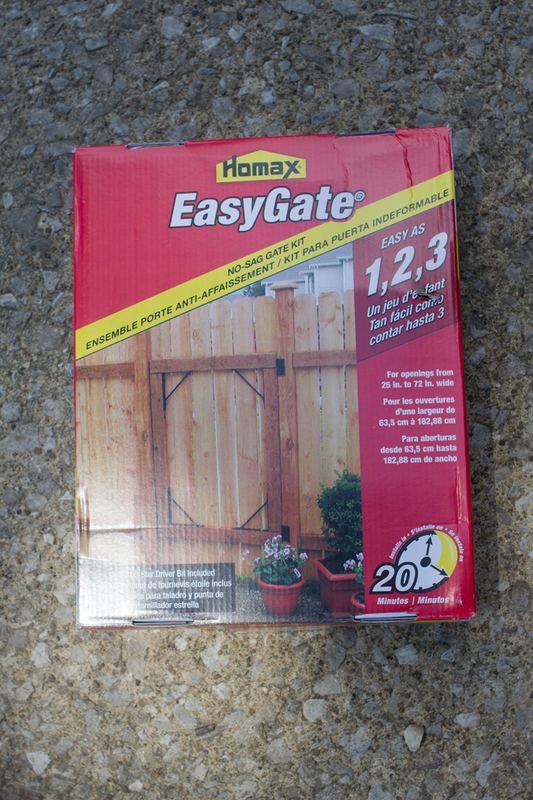 I’m no expert and I know that gates often have that diagonal piece that prevents sagging. I don’t understand the physics or engineering of that, so anything that advertised itself as “no-sag” seemed like the right call for me. This kit is pretty easy, although the “20 minute” claim on the box was the first of a few misleading — or flat out not true — things about it. You measure your opening, cut some 2x4s to match the size, and then square them off with the four corner brackets. If you’re quick I guess this could take 20 minutes. It took me longer. This also includes the hinges that allow the door to swing, but I want to note it does not include a latch, handle, or lock. 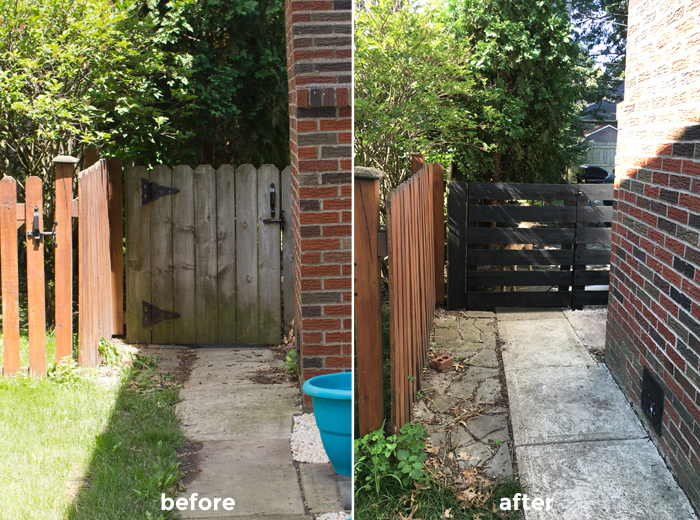 We wanted to do a horizontal fence, instead of vertical, just to try to match that modern look we go for. 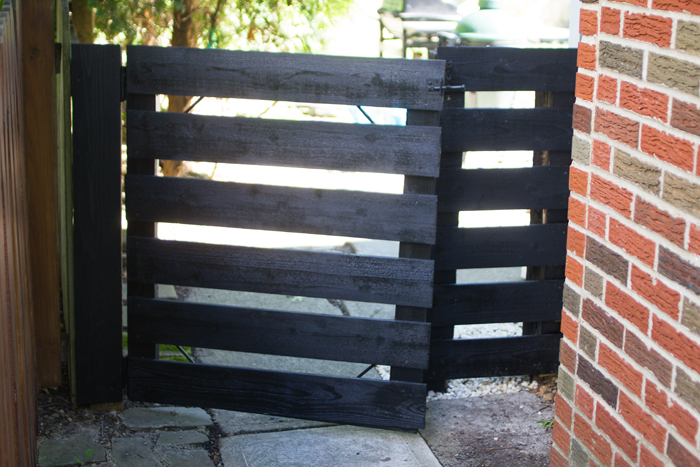 So I bought some fence posts, cut them to size, and stained them all black (we thought black would look cool). Again, the longest part of this process was letting the stain dry. I find that’s always the longest part of any project. I don’t know how all these other bloggers do it, where they get these huge projects done in one or two days. Do they just not let paint try?! I don’t get it. Anyway, after doing a little math, we found that leaving a two inch gap in between each board would be almost exactly the height we needed from the ground to the top of the fence. I started at the bottom, screwed the first piece in, and then used a 2 inch spacer to work my way up. This process took maybe 15 minutes. It was really easy. 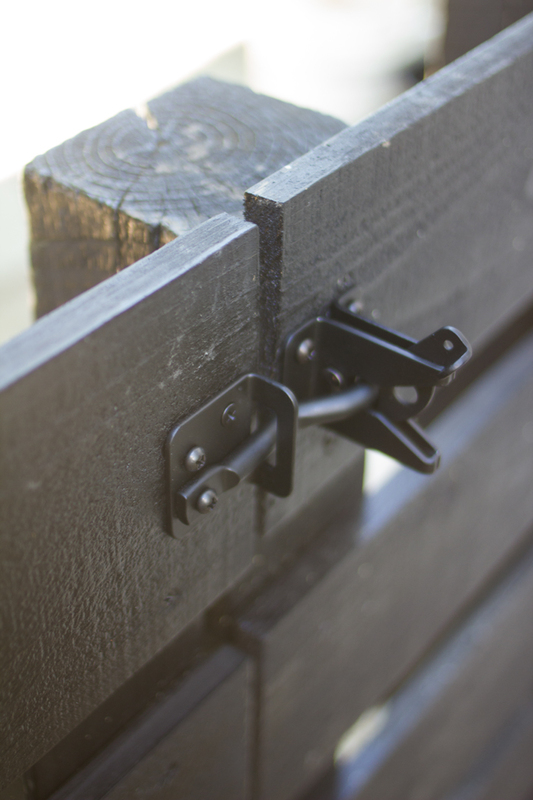 When it came time for a latch, we had two priorities: 1) it had to work, 2) it couldn’t be ugly. Number 1 was easy, because any new latch was going to work here, now that everything was lined up properly and there weren’t screws missing. However, #2 was a little trickier. I’m sure there are nice options out there, but I wasn’t interested in spending a ton of money or waiting for delivery on a latch. So my options were limited to what was at the Ace Hardware 2 minutes from our house. They weren’t fancy, but they came in black, which meant it wouldn’t stand out. Sold. And boy does it work. This gate opens and closes so easily now. It’s another one of those projects, I am so mad that it took me so long to start. 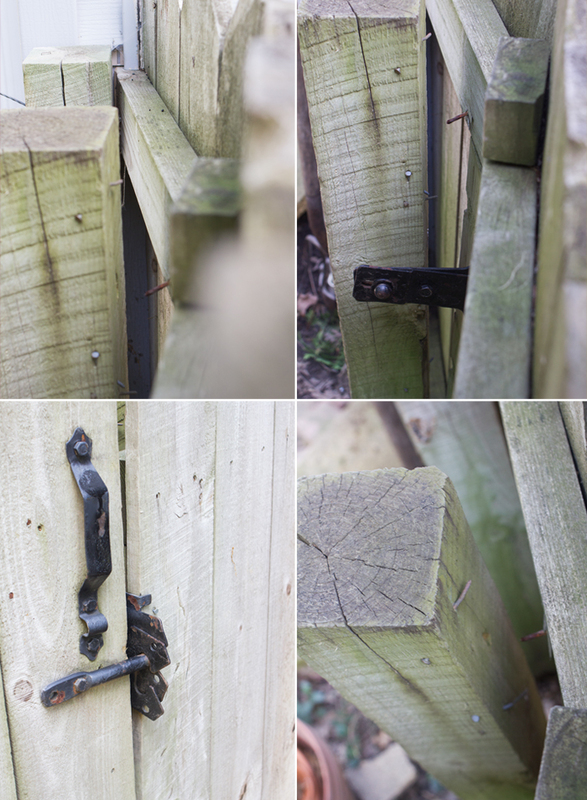 Swinging this gate open is a one-handed operation with the new latch and it has made such a difference. Now I just have to figure out what to do with the other 175 feet of fence around the yard.